United Southern Bank was a proud table sponsor of the 130th Annual Meeting and Dinner for the Chamber of Commerce. The speakers were Bill Thomason, President/CEO of Keeneland, Vince Gabbert, VP/COO of Keeneland and T.Kevin Flanery, President of Churchill Downs Racetrack, Senior VP of Churchill Downs, Inc. 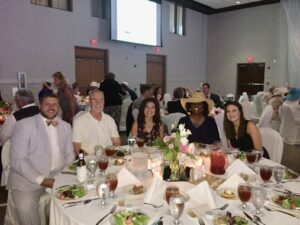 The dinner was held on Tuesday, June 26th at the James E. Bruce Convention Center in Hopkinsville, KY.